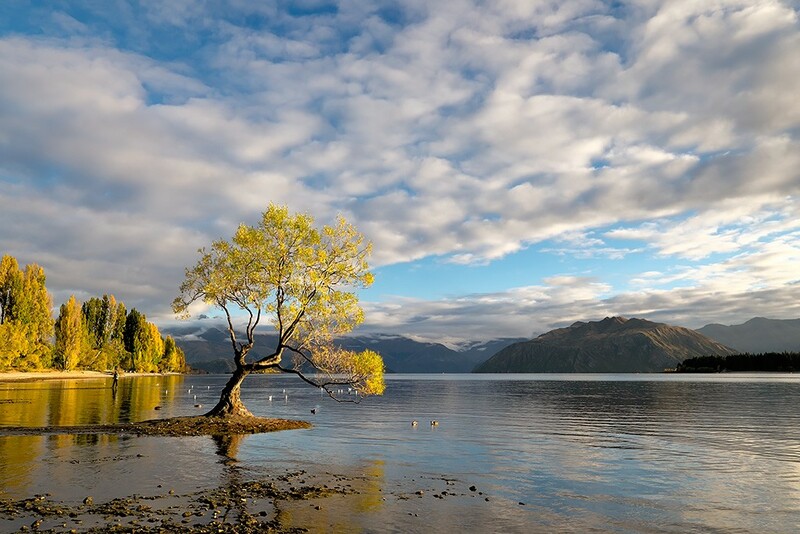 The Willow in the water at the lake in Wanaka is iconic. On our morning at “the tree” it started out slow. It was not looking like we’d get any magic light, however, once again patience paid off! For a few minutes just before calling it a wrap we were rewarded with a blast of gold light while the clouds lingered! It might be iconic but my goodness was it exhilarating when it happened! Lots of happy dancing going on this morning! It was hard to pick just one, but here it is! This is better than the similar pictures I’ve seen! The rocks and sky seem to point to the tree. So way cool, my friend. That is gorgeous John, and especially with that light! I have witnessed the same thing where the sun came up and the light seemed flat and I was wrapping it up and loading my gear into the car when all of a sudden and only for a few fleeting minutes, the light turned golden. This was in the Eastern Sierra by Bishop. It was amazing! Anyway, I wish I could have been there for this. Just lovely! I don’t know where to start.. the light, composition and all the elements just all came together, absolutely stunning. It looks like to is being lit with a spotlight. Gorgeous! Thanks for sharing it. It doesn’t get any better……. Absolutely stunning and worth the wait. It’s one thing to see images of golden moments… It’s another being there, experiencing and preserving the moment in pixels. Congratulations! glad you got light, John! And nice clouds, you were very fortunate! A compendium of composition! Wow! Great job capturing the radiance of the tree!